Paul Manafort To Be Sentenced In D.C. Conspiracy Case On Wednesday Donald Trump's former campaign chairman has pleaded guilty to conspiracy charges and admitted that he tried to tamper with potential jurors. Wednesday's sentencing could lengthen his time in prison. 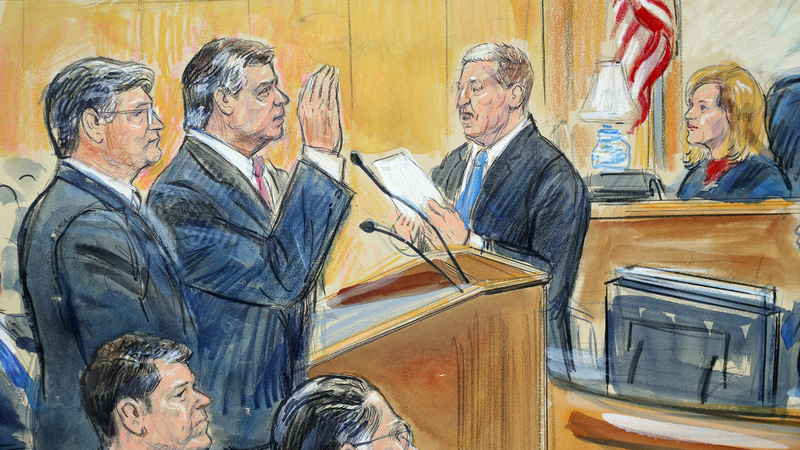 This courtroom sketch depicts former Donald Trump campaign chairman Paul Manafort (center) before U.S. District Judge Amy Berman Jackson in September 2018. She is scheduled to sentence Manafort on Wednesday. President Trump's onetime campaign chairman Paul Manafort is due back in federal court on Wednesday for sentencing in his criminal case in Washington, D.C. The hearing in U.S. District Court for the District of Columbia comes less than a week after Manafort was sentenced to just under four years in prison in a federal case in Virginia. Manafort's appearance for sentencing in D.C. on Wednesday could then close out his two-year fight with Justice Department special counsel Robert Mueller. One question that continues to hang over this saga, though, is whether the president might neutralize whatever sentence Manafort receives by deciding to pardon him — a move that Trump himself has refused to rule out. One front of Manafort's legal battle concluded last week in Virginia, where a federal judge sentenced him to 47 months in federal prison and ordered him to pay $25 million in restitution. A jury there convicted him last year of bank and tax fraud related to consulting and lobbying work he did in Ukraine. Now he faces sentencing in a second case brought by Mueller's team. Manafort pleaded guilty to two conspiracy charges revolving around undeclared foreign lobbying work he did on behalf of pro-Russian Ukrainian political figures. The matter was set to go to trial in September of 2018 before Manafort struck a last-minute plea deal under which he agreed to cooperate with the government. But that agreement collapsed after Mueller's team accused Manafort of lying to investigators late last year. After weighing the evidence, Judge Amy Berman Jackson agreed with the special counsel's office that Manafort lied about three subjects — a $125,000 payment; his contacts with a Russian associate, Konstantin Kilimnik, who the FBI says has ties to Russia's intelligence services; and about matters related to another ongoing investigation. The judge disagreed with the special counsel's office assessment that Manafort lied on two other subject areas. Manafort faces a maximum possible sentence of 10 years in Washington. The decision on how long to put Manafort away lies in Jackson's hands. Jackson also can decide whether any sentence she imposes is added to the 47 months that Manafort has already received, or whether he may serve the sentences simultaneously. The Virginia sentence, which was 20 years below the upper limit of the federal guidelines range, touched off a national discussion about disparity in sentencing. It is common, however, for defendants in tax fraud cases to be sentenced below the guideline range, according to U.S. Sentencing Commission statistics. In the D.C. case, Mueller's office has not taken a position on sentencing — as is its standard practice. But it emphasizes that Manafort "repeatedly and brazenly violated the law" and argued that his sentence "must take into account the gravity of this conduct." "His crimes continued up through the time he was first indicted in October 2017 and remarkably went unabated even after indictment," the special counsel's office said in its sentencing memo. "Manafort engaged in witness tampering while on bail and, even after he was caught for engaging in that scheme, Manafort committed the additional crimes of perjury and making false statements after he entered his guilty pleas," the office added. Manafort's attorneys, on the other hand, have pushed back against the special counsel's portrayal of their client as a "hardened criminal" who deserves no mercy. Manafort, who will turn 70 next month and suffers from gout, has accepted responsibility for his crimes by pleading guilty, his attorneys say. And they observe that he has not been charged with any crimes related to Mueller's primary mandate — Russia interference in the 2016 election and possible coordination with the Trump campaign. "In light of his age and health concerns, a significant additional period of incarceration will likely amount to a life sentence for a first time offender," they write in their sentencing memo. They also requested that any sentence in D.C. run simultaneous to Manafort's Virginia sentence.